He’s making a list and checking the Data Validity twice! The company you keep on an airplane is one of life’s roulette wheels. Most people subscribe to the ‘we’re all in this together’ approach by keeping to themselves until they have successfully made it from Point A to Point B. Every now and then you find yourself seated to a certain type. There’s ‘the talker,’ ‘the snorer,’ ‘the cougher,’ or my personal favorite, ‘the cover themselves up in a blanket from head to toe’ and re-emerge from their cocoon at the end of the flight. I group myself in the first category, and typically taper any initial small talk down as the flight is preparing to take off. However, a few weeks ago as we were heading back east after another great Water Loss TAP work session in the California Central Coast, I was next to what I would classify as ‘the talker.’ Fortunately for me, it was Santa Claus. That’s right, St. Nick right there in 19B. Meet Charley Carlin. He used to work in the oil and gas industry, now he is a travel agent, of sorts, for those looking for quirky destinations off the beaten path. Think world’s largest ball of twine, or the museum of buttons; you get the picture. Charley is also booked up during the Holidays as he dons the red suit and takes the helm of his sleigh through many Christmas parades and other events. 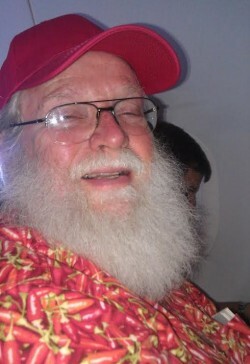 He has a long white beard and always wears a red hat – either a warm winter hat, or a baseball cap like when I met him. Charley also passes out Christmas cards to children wherever his travels may take him – mine, in particular, were very excited to receive them and to hear that their dad sat beside Santa Claus on the airplane. Charley told me about so many of his travel stories to hidden areas that he never would have found if he did not ask himself time after time, ‘I wonder what is down that road?’ or when a sign indicates an attraction he’s never been to and it is 20 miles off the main road, asking ‘Why not?’ You can insert your choice of philosophical interpretations here (I certainly have), but I’ll stick to one that was fresh on my mind off our trip to California to discuss Water Loss Control. Often, we look too far out of our wheelhouse for solutions to our water losses. We need better meters, we need more leak detection devices, we need more resources for a meter testing program, we need to upgrade our technology in general. All of these are certainly options that can help water systems with their water loss control programs, but sometimes they can be misguided, or just hopeful for a Christmas miracle. Just like Charley encouraged me to see what is right outside my front door, we want to encourage water utilities to take a hard look at what they have; heck, they don’t even have to go outside their front door. We have seen, through our first wave of work sessions with the CA-NV Section of AWWA’s Water Loss Technical Assistance Program, or Water Loss TAP, that utility staff (managers, production, billing) walk through the doors with an idea that they need to do one thing, and then after getting a better understanding of what a water audit can do and how it can help guide them to make smart decisions, they leave feeling empowered to take another approach. It doesn’t happen overnight. Utilities understand that this is a long-term process and it starts with a fair and honest evaluation of their data, and how they can apply validated water audit results to improve their system. As I write this, I’m heading back east after our last full week of Wave 1 work sessions of the Water Loss TAP. I do not have Charley’s company for the flight, nor his appreciation for combating water losses – he lives in Paso Robles, CA and told me he hardscaped his property long ago; but I will be more open-minded the next time I think I’m sitting next to ‘the talker.’ They just might have something important to say that has an impact in a way I could not have predicted. It’s our hope that our utilities in the Water Loss TAP and all of our state programs have this same feeling after learning about water auditing and loss control. So take note of Charley’s philosophy as well as what you have at your fingertips when thinking about your water losses. You just might have the answer right in front of you.